It may be a long way to go for a bowl of pasta with olive and salt, but former professional cyclist Patrick Jonker says the 85km ride from Moana, south of Adelaide, to Nino’s Pizza Bar and Cafe at Victor Harbor will reward with the best sampling of the seemingly simple Italian dish you can find. Still, there’s more to “Nino’s Ride” than the famed bowl of pasta on which Jonker and his fellow Australian Institute of Sport (AIS) riders would fuel up during their daylong 220km training rides in the 1980s and ’90s. There’s an undeniable beauty anyone who ventures out on Jonker’s favourite bike ride – which totals 136km for the round trip – won’t take long to discover. 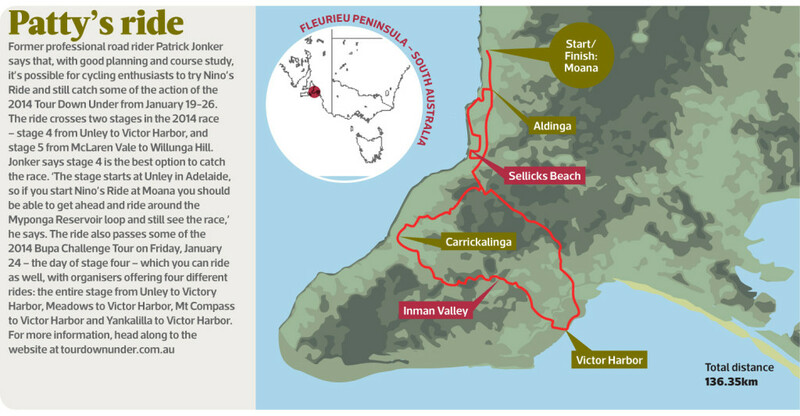 These days, Jonker no longer takes his original route, instead opting for an adapted version that savours the cycling experience in one of South Australia’s most picturesque and historically significant regions. His ride now starts in Moana, a seaside holiday town 50 minutes’ drive south of Adelaide. The 44-year-old has also added a loop that includes the Myponga Reservoir and towns of Normanville and Yankalilla before arriving at Victor Harbor. From there, a quick pedal to Albert Place and you’ll stumble upon Nino’s, founded in 1974 by cycling identity Nino Solari and owned and operated by Simon and Kirsten Pitman since 2000. It’s a beautiful course overall, crossing parts of the 2014 Tour Down Under (TDU) route – stages four and five – and is as diverse for its terrain and beauty as it is for the region’s Anglo-Saxon and indigenous history and culture. 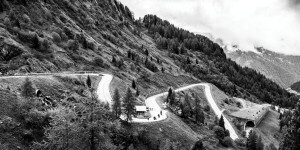 Most importantly, the challenges – in the form of several climbs – are all achievable to pass at your own pace, so long as you have the right gearing. We meet Jonker at 6.30am outside the Deep Blue Cafe at Moana, which was once prime farming land until Adelaide’s urban sprawl. The town, whose name means “Blue Water” in Maori, is clearly out of season when we arrive. The sparse activity is highlighted by a small group of local riders who pedal past the closed cafe, vacant seaside apartments and closed Moana Surf Life Saving Club. Still, as we prepare our bikes, drinks and food for the ride by the turquoise waters of Gulf St Vincent, and while a chilly early morning breeze blows from the south-east, it’s not hard to imagine Moana on a weekend or in peak summer season. You can picture the cafe in full trade as beachgoers await their fish and chips, the Surf Club a hive of activity for surf patrols, and other sports events like the Bike Society Tri Series of which Moana hosts three of four rounds in the 2013-14 series. The ride takes us from the Deep Blue Cafe, up Nashwauk Crescent and south before turning right onto Commercial Road, a narrow and lumpy road that, while quiet and largely vehicle-free in Jonker’s early cycling days, now has its fair share of traffic. We soon begin a short but testing 400m climb that rises at 10 per cent gradient. Jonker says he still tries to cycle up this entrée to the day’s menu of climbing in the big chain ring, but concedes that doing so is now ‘a bit of a struggle’. We head south for six more kilometres with the sights of hay bales and vineyards either side of us – and the hills we are to climb on the horizon – before turning right into the more peaceful Tuitt Road towards Maslins Beach, Australia’s first official nudist beach. We then make a right into Port Road where we pass a pocket of wooden shacks, then left onto The Esplanade at Port Willunga where, 10km into the ride, the Star of Greece Cafe awaits. It would be easy to miss the Star of Greece thanks to the inviting feel of the smooth, wide and traffic-free road surface under your wheels as you hit the Esplanade, one of the iconic stretches of many a TDU route – although usually from the opposite direction. But here’s a tip: it’s definitely worth looking out for and making the stop, if not for the reputed gastronomic experience of its ‘a la carte’ menu – which offers entrees at $16-$18, main courses from $29-$31, or a $65 tasting menu, though it was unfortunately not available for us as the cafe was closed – then simply to enjoy the view and absorb the historic significance. The cafe was named after a fully loaded trading ship sunk 200m off-shore on Friday, July 13, 1888, after clearing the Semaphore Anchorage. Of the 27 crew and possibly one passenger and stowaway on board, only 10 people survived the disaster. The wreckage remains five metres under water and 850m north-west of the cafe, and while it is a protected site it is also a very popular diving spot. From the Star of Greece, time lost from your visit will be easily made up riding on the smooth bitumen of The Esplanade – albeit pending the direction of the wind. The Esplanade takes you to and by Snapper Point and then to Silver Sands Beach, where a left-hand turn inland at Gulf View Road takes you by olive groves to the left and right and then to Main South Road for the approach to the first main climb: Sellicks Hill, which is six kilometres long and at an average 5.5 per cent gradient. Local indigenous history, explains Jonker as we ride on, dates back thousands of years to the indigenous Kaurna, Peramangk and Ngarrindjeri people, among others. The coastal stretch behind, he adds, was part of an aboriginal trading route named the Tjilbruke Dreaming Track that extends to Cape Jervis. Jonker continues to explain how thousands of years ago one young aboriginal man was speared to death for breaking tribal law by killing a female emu. His grieving uncle – the Tjilbruke, or “Keeper of the Law” – carried his nephew’s body from Sturt River to Cape Jervis, a route that is today littered with springs. ‘The legend goes that all the springs along the way are the tears of the Tjilbruke as he carried his nephew,’ says Jonker. Sellicks Hill really is a climb to enjoy. The road is smooth and manageable so long as you choose the gearing to ride steadily but comfortably on the road’s safe shoulder. It assures the safety needed to turn and savour the breathtaking panoramic view unfolding behind you. As the road winds up to the trees, Jonker glides away with seemingly little effort, showing his 12 years as a professional are still paying dividends. He continues to do so to the top at about 30km. He then turns right and out of sight up Reservoir Road for a two-kilometre climb that is quieter, but steeper. This second climb, and the rise soon after from Myponga Reservoir – which was opened in 1962 and provides five per cent of Adelaide’s water – are the toughest sections of Nino’s Ride. They both include gradients with the steepest pitches ranging from 12 to 14 per cent. But the effort you put in to get to the top will be worth it, for after ascending Reservoir Road, you’re met with a wide expanse of farmlands and the vista of the Gulf below, reminding you just how far you’ve climbed. At the top, Jonker recalls how when he first rode here, sections of the road to Myponga Reservoir and Carrickalinga were dirt. With the road now resurfaced, a smooth and breathtaking passage over a wind-struck plateau is yours. For the city slicker accustomed to the smell of car, truck and bus diesel in heavy traffic, the contrasting but natural odour of fresh cow dung blowing from nearby pastures is a veritable perfume. Before Myponga Reservoir and after 35km, Jonker warns that a short descent that is tricky, especially if wet, awaits. While the weather Gods favour us, as you ride across the narrow two-lane passageway that is the dam wall you can’t help but sense the volume of building water on your left and the precipice of a sheer drop to the bottom on the other. It’s strong enough to lift your cadence and reach the other side as quickly as possible for the short and steep 500m climb out from the reservoir. After climbing out from the reservoir, it’s worth stopping to not just get your breath back, but also to appreciate the view of the descent and the contrasting image of what is on either side of the reservoir wall. turn left towards Normanville. Four kilometres further and with 55km ridden, we reach Yankalilla, originally inhabited by the Ramindjeri people in the Bungala River valley beneath the Mount Lofty Ranges. At Yankalilla it’s definitely worth stopping at the award-winning Yankalilla Bakery for a coffee or one of their vast range of pastries. The vegetarian pasty is as fresh as it is full to the brim with diced vegetables; and, as I found, easily digestible to continue riding. The break also means it’s time to make a choice – to ride on to Victor Harbor, or return to Moana. If you’re weary and Moana beckons, ride north and down Main South Road towards Myponga and Sellicks Hill for an undulating ride with a solid three-kilometre climb from Yankalilla that passes more farmland and English or Welsh styled stone walls. Then, from the top of Sellicks Hill, take the six-kilometre descent back down towards the coast, a route that will offer up some panoramic views of the coast. Another great option is to stop at the Victory Hotel on your right. Established in 1858, the hotel is surrounded by the 2.8-hectare “Rudderless” vineyard owned by Doug Govan who, since 1989, has been the pub’s proprietor. The views are superb over the Gulf from both out on the terrace and inside the pub, where behind the bar you’ll find rare wooden framed bar fridges. For the long stayers in the pack, full meals are available, and for those with alternative travel options for the return trip to Moana – sans bike – there is an extensive wine list that includes Govan’s trademark Rudderless Graciano and Shiraz Malbec, all on offer for free tasting. Ask for a visit to the wine cellar – it is worth a peep. If a big day out is your go and you have more in the tank after your stop at Yankalilla, you’ll be rewarded if you decide to put off the early return as we did and push on to Victor Harbor for an undulating 28km up Victor Harbor Road. It is scenic and quiet – yet not without challenges. Soon you’ll reach the climb up Bald Hill, a steady three-kilometre ascent that at seven per cent gradient is steady and plentiful for quality views, especially of local sheep and dairy cattle grazing. Jonker says if you start the ride early enough, it’s not uncommon to also see kangaroos. Jonker quickly settles into his rhythm, providing a steady tempo to follow to the top before the descent into Inman Valley, the lush countryside that protects us from the wind – at least until 15km to go, when a headwind buffets progress towards a two-kilometre climb. 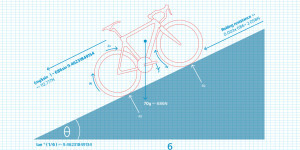 The ascent is used regularly in editions of the TDU that include a stage into Victor Harbor. Energy is what anyone will still need for the journey back to Moana from Victor Harbor. It starts on Hindmarsh Road and goes down Victor Harbor Road, road signs pointing to Adelaide. The first six kilometres back, says Jonker, can be busy, especially on Sunday afternoon, but it settles after taking Hindmarsh Tiers Road into the countryside for some solid climbing to Mount Billy Conservation Park, a popular hiking region also known as the Kaurna Land, after the Kaurna people. It’s a serene part of the Fleurieu Peninsula. Jonker tells stories as we ride, and you can’t help but wonder of the aboriginal history as you take in a countryside that appears unchanged since the days of early settlers. It helps take your mind away from the building fatigue as you return to Sellicks Hill after turning left onto Pages Flat Road, and soon after right onto Main South Road towards the top of the climb. At this stage there’s about 120km ridden and you’re in readiness for the dream descent to the coast. If you still have time in the day, don’t miss the chance to stop and enjoy the view one last time – or to visit the Victory Hotel near the bottom of the descent for a drink, a bite to eat, or to regroup with those fellow riders who may have skipped the extra loop and ridden ahead at Yankalilla. The finish isn’t far from here. After Sellicks Hill, you’re soon back at Aldinga where you turn left onto Old Coach Road, which takes you – quite often with an assisting tailwind – to three short, hard, but final climbs. ‘We try and sprint over in the big chain ring,’ Jonker says before the last kilometres to Moana, where a left turn into Nashwauk Crescent guides you back to the Moana Deep Blue Cafe.  To join Patrick Jonker on his favourite ride, Cyclist flew with Virgin Australia and also stayed at the Adelaide Hilton Hotel, the official accommodation for the Tour Down Under. For all flight details and costs to Adelaide check Virgin Australia, Qantas, Tiger Air and Jetstar. For special packages to the 2017 TDU, go to tourdownunder.com.au. When enquiring, don’t be shy to ask about the diversity of accommodation standards and rates – they vary. Staying at the Hilton during the TDU is a logistical luxury as everyone and everything is based there, but Adelaide is easy to get around and accommodation is diverse. Apartment-style accommodation is quite often valued-added if you can get the numbers to share with you.